If you have been charged with a controlled substance crime in Dallas, you will need the help of an experienced drug lawyer. The laws are incredibly complex, and no two cases are exactly alike. However, this guide to drug sniffing dogs can help give you some background, so you’re better prepared for your Dallas drug attorney consultations and for the case as it unfolds. Regardless of the situation, you have a right under the law to be protected from unlawful search and seizure. This means that before an officer searches the inside of a vehicle, he must have probable cause. There must be evidence that shows why the officer had reasonable suspicion to believe you were involved in a crime. He is not legally allowed to act on a hunch, but he can search if he sees evidence in plain sight or smells marijuana. Dallas officers have also been known to use questionable tactics to either gain access to your vehicle or to get you to consent to a search. The initial hearing is referred to as a “probable cause hearing,” because this is when it’s established whether the officer had it and the case can commence. It’s worth noting that a drug sniffing dog can be called to the scene, regardless of whether probable cause exists or not. The Illinois Supreme Court’s decision in Illinois v. Caballes upheld law enforcement’s right to have a dog on the scene. In this case, a man named Roy Caballes was stopped for speeding. A drug sniffing dog was brought to his car and the dog “alerted,” or signaled to officers that there were drugs in his vehicle. Officers searched the vehicle, and Mr. Caballes was subsequently charged with marijuana trafficking. There are a few caveats to this ruling, though. For instance, an officer is not allowed to hold a suspect for a lengthy period of time while waiting for a dog to come to the scene. He must proceed normally during a traffic stop, and only keep you long enough to run your tags, check your license, and issue a ticket, if one is warranted. If he does not follow standard protocol, utilization of the drug sniffing dog becomes suspect. If an officer believes you have an illegal substance, but he does not have probable cause to search, he may ask you for permission to search your vehicle. He may also ask you to wait for the dog to arrive on the scene. These are requests that you do not have to comply with, and you can simply say, “I don’t want to stay. May I leave?” An unscrupulous officer may push the limits and try to strong-arm you into it, and your actions may be scrutinized as well. If you open your door or give your keys to the officer, a judge may construe it as consent to search. Canines have truly amazing noses, with more than 200 million receptors, compared to a human’s paltry 10 million. Some breeds can even track scents under water, which makes them a boon for officers trying to outsmart criminals with various wrappers and scent decoys. However, the animals are not accurate 100-percent of the time, and their precision has been called into question in courts of law before. The American Society of Canine Trainers (ASCT) even admits to the incredibly poor accuracy rates of medicine smelling canines, pointing out averages as low as 62% (Currency Searches, 2015). There are many causes for this low rate of accuracy. For starters, canines have such sensitive noses that they can pick up trace scents, even after a drug is no longer present. 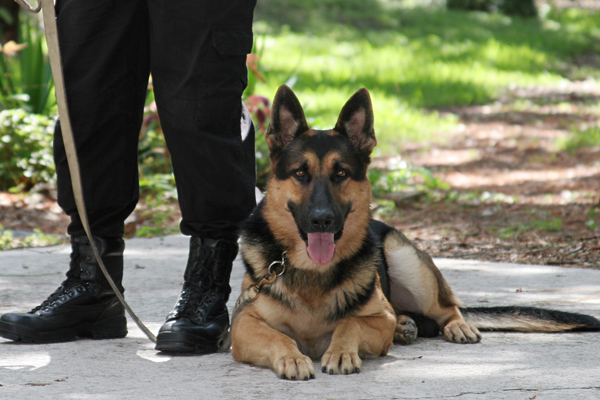 Plus, a lot of how a drug sniffing dog behaves comes down to his training and handling. There are presently no national standards for accreditation when it comes to this training, either. On top of this, it’s not always possible to verify why a dog alerted. Though this generally means that the dog sits when he picks up a scent, he may sit because the officer gave him an alternate signal, either intentionally or unintentionally, or because he’s resting. In some cases, a dog might simply sit because he has been walked slowly around a vehicle repeatedly. Even though officers are in a position of power, they are not always right. If you feel that you were treated unfairly or that your rights were violated, you should reach out to a competent drug lawyer, such as those we feature on this site. To learn more about the specifics of your case, review the profiles listed here and schedule your free consultations right away.